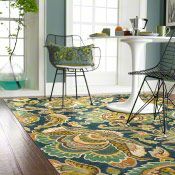 A room’s “fifth wall,” the floor, can showcase dramatic area rugs that are so breathtaking in color and design, they’re like works of art. And rugs can change the feel of a space in minutes—so you can do a room makeover on your lunch hour. 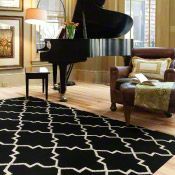 Rugs look great layered over carpet or adding warmth and color to hardwood, LVT Flooring, resilient-vinyl, and tile.